We all know how well Nicole Richie pulls off the hippie headband / head piece look. I do think it is a difficult style to pull off, as it does not work for everyone. I think its down to face shapes. Nicole Richie wears her trademark headband in many different ways, sometimes with a scarf other times with a band ..
Other celebs such as Mary Kate Olsen and Mischa Barton are now known for wearing headbands in this style. 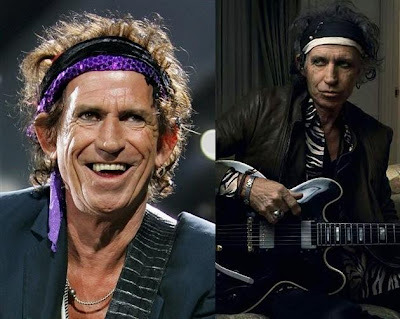 Maybe Keith Richards was their inspiration ..
he totally should create his own collection of hairbands! Mischa Barton loves them so much she has collaborated with a famous hairband designer Stacey Lapidus to make her own collection. Mischa's collection is cute, you can view it Here!! It is a gold mirrored head piece and as it is the most wanted piece of the House of Harlow 1960 collection, i guess that is why it is $165!! Nicole Richie has recently been quoted saying how she plans to expand the entire brand of House of Harlow and hopes to introduce handband and sunglasses and perhaps one day clothing.